If you're a first time visitor to Hawai'i, O'ahu is probably your first stop. This is the "main" island-the most developed and the most populated. Some of the state's iconic attractions, like Diamond Head, Waikiki Beach, 'Iolani Palace and Pearl Harbor are located on O'ahu's south shore. O'ahu is where you go for the urban Hawai'i experience-it's home to Honolulu, the capital city, with its shopping, dining, arts and culture-but the island is also home to some of the finest beaches and most beautiful mountain vistas in the state; you just have to be willing to get out of Waikiki to see them. O'ahu is called "The Gathering Place" because in the 1800s Honolulu Harbor provided safe anchorage to whalers, traders and other visitors. 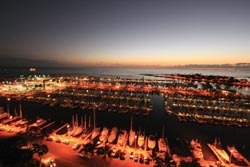 Since 1794, when a British ship first navigated the narrow entry to the harbor, Honolulu has grown into the state's center of commerce, government and culture. About 80 percent of Hawai'i's 1.3 million residents live on this third largest Hawaiian island, with an area of nearly 600 square miles and 230 miles of coastline. A broad valley separates its two mountain ranges, the Ko'olau and the Wai'anae. Officially the entire island is considered the City & County of Honolulu, but residents call Honolulu and its suburbs simply "town," while they call other areas of O'ahu by unofficial names: the North Shore (also known as "country"), the Windward Side to the east, the Leeward or Wai'anae Side to the west. 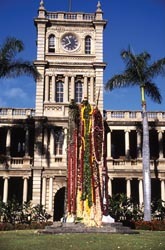 While thoroughly modern, Honolulu retains some elements of old Hawai'i, like 'Iolani Palace (the only royal palace in the United States), and other monarchy and territorial-era buildings. The Ala Wai Golf Course is a beautiful and relatively inexpensive public course, and several parks provide free access to the city's spectacular beaches. There are restaurants running the gamut in cuisines and prices. Try some authentic Hawaiian food (laulau, poi, chicken lu'au, haupia); local plate lunches (with the entrée you get a scoop of mac salad, rice, and kim chee); the local favorite-Spam-comes in sushi form as "Spam musubi" (try it before you judge it). For a finer Hawai'i dining experience, try a restaurant specializing in Hawai'i Regional Cuisine, like Roy's or Alan Wong's. Shopping also runs the gamut, from tony shops in Waikiki to tiny boutiques in Kaimuki. Downtown Honolulu is the administrative and commercial heart of the city, with government and business offices, restaurants, condominiums and a small but vibrant Chinatown. On the outskirts of downtown are several historical sites within walking distance of each other. 'Iolani Palace was built in 1882 by King David Kalakaua (otherwise known as "The Merrie Monarch"). A progressive thinker, Kalakaua had 'Iolani wired for electricity and telephones-the first government building in the world to have such technology, even before the White House. The palace grounds are the site of the overthrow of the Hawaiian monarchy in 1893, and it's where the last monarch, Queen Lili'uokalani, was imprisoned in 1895. Many of the rooms have been restored to their monarchy-era splendor. Across from the palace is the statue of King Kamehameha I, the iconic image featured on the back of the 2008 Hawai'i quarter. Nearby is Kawaiaha'o Church, the first Christian church in Hawai'i where services are still held, and the Mission Houses Museum, which offers a look at the cultural influences brought by the missionaries from New England, who began arriving in 1820. In the heart of downtown is Chinatown, with restaurants, acupuncturists, herbalists, noodle factories, art galleries, tattoo parlors and food markets. Two plazas worth visiting-for those with some olfactory fortitude-are the Chinese Cultural Plaza and the Maunakea Marketplace. Chinatown has recently become the epicenter of a thriving arts and culture renaissance, with a number of new galleries and music venues. Every first Friday of the month, the streets are closed to traffic, the galleries and shops are open late and Chinatown becomes a pedestrian-only street party that throbs into the morning hours. Makai of Chinatown, across Ala Moana Blvd., is Aloha Tower Marketplace, a large outdoor shopping/dining complex built primarily to serve passengers on incoming cruise ships. Across Vineyard Blvd. just mauka of Chinatown is Foster Botanical Garden, one of the finest urban gardens in the country, where you can see specimens of rare and endangered native plants as well as the famous Bodhi tree- a descendant of the tree in India under which the Buddha is said to have achieved enlightenment. A few miles mauka and 'Ewa of downtown is Bishop Museum, which houses the world's largest Pacific natural history and Hawaiian culture collections. The museum's Watumull Planetarium offers astronomy buffs a chance to learn about the sophisticated astronomical knowledge of the Polynesians. The centerpiece exhibit at Bishop Museum, Hawaiian Hall, was recently given a multimillion-dollar renovation to better display its unparalleled collection of Hawaiian artifacts, including priceless feather capes and headdresses worn by the ali'i, or royalty. The National Memorial Cemetery of the Pacific, called Punchbowl because it's located in a bowl-shaped volcanic crater, is a somber and impressive monument; there are more casualties of Pacific-theater action buried here than anywhere else in the United States. At the edge of the crater is a lookout area from which you can get a panoramic view of the city and the ocean beyond. 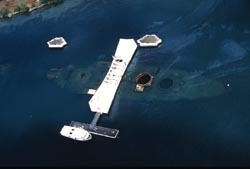 If you're a history buff, don't miss the various monuments located around Pearl Harbor: the USS Arizona and the USS Oklahoma Memorials as well as the USS Missouri, the ship on which the Japanese surrendered to Gen. Douglas MacArthur to end WWII. Proceeding toward Diamond Head along Ala Moana Boulevard from downtown Honolulu, you'll come to Kaka'ako Waterfront Park, Ala Moana Beach Park and Ala Moana Shopping Center. The center is the largest outdoor mall in the world, and it offers a shopping experience like no other. Residents and visitors from all parts of the world rub elbows; high-end boutiques, local craft shops and Asian department stores cater to a variety of shoppers, from thrifty locals to international jetsetters, all in a breezy, tropical setting adorned with Hawaiian flora and koi ponds. From the shopping center you can walk across Ala Moana Boulevard to Ala Moana Beach Park and "Magic Island," which offer swimming, surfing and beautiful sunset views. You can also walk into to Waikiki or take a bus from the lower level of Ala Moana Shopping Center to any part of the island. Look toward the mountains, and you'll see one of O'ahu's natural gems: Manoa Valley, the location of the University of Hawai'i and the site of almost daily rainbows. Drive to the very back of the valley to stroll through Lyon Arboretum, with its incredible collection of plants from all over the world, including indigenous species, or park and walk the easy, mile-long trail to Manoa Falls, a thread-thin waterfall in the heart of a tropical rainforest. Going further east along Ala Moana Boulevard, you'll come to Waikiki, where the beaches are within easy walking distance of most hotels. This is the world-famous stretch of sand with the iconic profile of Le'ahi (otherwise known as Diamond Head) in the background. Historically Waikiki was a playground for Hawaiian royalty. It was once a wetland abundant with fishponds and taro patches bordered by groves of coconut trees. 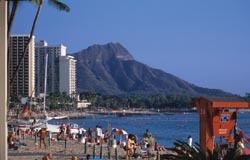 By the 1920s the golden age of luxury liners established Waikiki as a premier tourist destination. In the 1960s jumbo jets began landing at Honolulu International Airport, ushering in a new era of tourism centered around Waikiki. Here the ocean is calm (ideal for swimming) and the waves are perfect for beginning surfers. 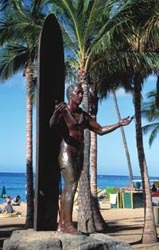 At Kuhio Beach Park near the eastern end of Waikiki, the statue of Olympic hero Duke Kahanamoku welcomes you with open arms. Regarded as the father of modern surfing, Duke surfed Waikiki at the turn of the century. You can rent watersports equipment here-surfing, stand up paddling and snorkeling-and the entrepreneurial beach boys are only too happy to teach you to surf or simply plant an umbrella over your chaise lounge (for a fee). Near the Diamond Head end of Waikiki are the Honolulu Zoo, the Waikiki Aquarium (where you can see endangered Hawaiian monk seals) and Kapi'olani Park. Jogging, walking, tai chi, hula, yoga and soccer are among the many activities in the park. For a bird's-eye view of Waikiki, there's an easy 0.8-mile trail to the top of Diamond Head State Monument. On a clear day you might see the island of Moloka'i. For cooler and more pleasant hiking conditions, it's best to go in the morning or late afternoon. If you're a surfer who's outgrown the bunny slopes of Waikiki (or who's just looking for less crowded waves), there are several breaks along Diamond Head, as well as comparatively secluded beaches at the foot of the mountain. Just park along the coast road and head down one of the paved paths to the shore. On the mauka slopes of Diamond Head is Kapi'olani Community College, which has a showcase Culinary Institute of the Pacific program. Make reservations for lunch or dinner at its restaurant on the college campus, where you'll be treated to a first-rate meal and a great view. Early Saturday mornings, a popular farmers market in the college's parking lot attracts residents from all over the island to sample locally grown produce and other foods. East of Honolulu, H-1 turns into Kalaniana'ole Highway; head in this direction, and the natural beauty of O'ahu will unfold. You'll pass through a series of suburban neighborhoods defined by the valleys along Maunalua Bay: Kahala, Wailupe, 'Aina Haina, Niu, Kuli'ou'ou and Hawai'i Kai. At Koko Marina Shopping Center in Hawai'i Kai, you'll find a number of watersports outfits offering everything from jet skiing to scuba diving to parasailing. Looking east, you'll see the giant cone of Koko Crater; there are hikes to the summit for the intrepid, and for the less adventurous there's a botanical garden inside the crater with one of the largest and oldest groves of plumeria trees in the state. Access is free. Head up the hill along Kalaniana'ole Highway to Hanauma Bay Nature Preserve, an idyllic bay with azure, calm waters good for snorkeling. The bay is one of O'ahu's most visited areas, and the large numbers of people have put pressure on the reef. One measure instituted to protect the ecosystem is a daily quota on the number of people allowed in, and on Tuesdays it's closed entirely. Anyone wishing to visit the bay must first pass through the Marine Education Center, with exhibits of dolphins, whales, penguins, and sea lions. Get there early or you might find the parking lot is full. Heading farther east along the highway, you'll drive along the spectacular and wild Ka Iwi coastline. There are several lookouts along the highway; if it's whale season (November through May), there's a good chance you'll see humpbacks spouting (or breaching if you're lucky) from one of them. Stop at Halona Blowhole lookout and watch a sixty-foot jet of ocean spray forced through a hole in the reef; to the right of the lookout parking lot is a tiny cove beach nicknamed Eternity Beach (because it's the location of that famously racy scene in From Here to Eternity). You can walk down the rock path and swim in the cove, where you're almost guaranteed to see Hawaiian green sea turtles lazing. Use caution and don't swim here if conditions are rough. Just past Halona Blowhole is Sandy Beach, one of the best bodyboarding beaches in the world-and also one of the most dangerous. The shorebreak has a reputation for broken necks and backs, so if you don't know what you're doing, it's best to stay on the beach. Talk with the lifeguards before venturing in if you aren't sure. Continuing along, you'll come to Makapu'u Point, where you can park and take the short hike on a paved road up to the Makapu'u Lighthouse. Here you'll be rewarded with a stunning view of the Windward side. On the nights of the full moon, this is a popular spot for locals who hike up to watch the moonrise over Moloka'i, which is usually visible on the eastern horizon. As you continue east along Kalaniana'ole Highway, you'll pass over Makapu'u saddle. You're now officially on the Windward side, with its awe-inspiring vistas, lush vertical cliffs and crystal-blue ocean. Almost immediately you'll come upon Sea Life Park on the mauka side of the highway-dolphin shows, a central display tank with hammerhead sharks and other Hawaiian marine life, and even a resident "wholphin," a hybrid of a false killer whale and a dolphin. 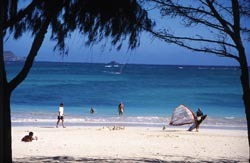 Continuing along Kalaniana'ole, you'll come to Waimanalo, with its beautiful, white-sand beach. Waimanalo is where the locals go for picnics on a Saturday afternoon-lots of beach, good swimming, no crowds. Turn off the highway at the sign for Waimanalo Beach Park (there are showers and bathroom facilities here). A couple of miles past Waimanalo town is the quaint beach community of Kailua, with its magnificent pair of beaches: Kailua Beach and Lanikai Beach. With its powder-white sand, calm water and view of the Mokulua Islands, Lanikai is consistently rated among the top ten beaches in the United States (and often no. 1). Kailua Bay and Lanikai offer great stand up paddling, kayaking and swimming; Lanikai also has some good snorkeling on calm days. There are several companies in Kailua that rent watersports gear. Best to get to these beaches before 5 p.m., as they are northeast-facing and often in shadow by late afternoon. A quick detour from the coastal route takes you to the Nu'uanu Pali Lookout, where you'll see a beautiful panorama of Windward O'ahu. (You can also get here from Honolulu by taking H-1 to the Pali Highway.) You'll be treated to a spectacular view-Kane'ohe Bay, Kane'ohe town, Kailua town and a magnificent stretch of vertical mountains to the north. Winds can be strong at the lookout, so be prepared for weather. This is also the site of one of the most significant events in Hawaiian history. In the final battle to unite the Hawaiian Islands, King Kamehameha I drove O'ahu's defending army up through Nu'uanu to the cliff at the pali lookout. Rather than be captured or killed, O'ahu's warriors threw themselves from the cliff. To continue heading up the Windward side, take Kamehameha Highway (locals call it "Kam Highway") through Kane'ohe. Be sure to stop at Byodo-In Temple in the Valley of the Temples in Kahalu'u. This replica of a Buddhist temple in Japan sits in a lush, serene place; you'll be tempted to spend some time soaking in the tranquility. Back on Kam Highway again, notable sites along the way to the North Shore include Kualoa Regional Park, where you can swim, picnic, sunbathe and walk on long stretches of sand with a view of Chinaman's Hat, the islet nicknamed for its conical shape. You'll pass through the town of La'ie, where you can visit the Polynesian Cultural Center, Brigham-Young University and a large Mormon temple. Be sure to stop off in Kahuku for locally farmed shrimp served from one of several lunch trucks you'll see on the right side of the highway-you've never had garlic shrimp never that good. 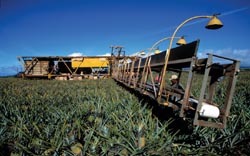 Small roadside booths also sell fresh pineapple, bananas, coconuts, sugar cane, sweet corn and other in-season produce. The North Shore beaches, stretching for almost twenty miles, provide myriad opportunities for sunbathing, swimming in turquoise waters and of course surfing. However, only expert surfers should attempt to ride North Shore waves, even when they appear small. During the winter months, though, they're rarely small: Monstrous waves reaching heights of up to fifty feet provide spectators a chance to see the world's greatest surfing in competitions held at Waimea Bay, Banzai Pipeline (at 'Ehukai Beach), Sunset Beach and Hale'iwa: The Vans Triple Crown of Surfing is held every November/December, and the Quiksilver Eddie Aikau Invitational is held at Waimea Bay only if the waves reach at least forty feet. If you happen to be on the North Shore during non-winter months, the ocean is as placid as a lake, and spots like Waimea Bay become idyllic swimming and snorkeling beaches. On calm days, the large tidepools at Pupukea (a spot affectionately called "Shark's Cove," even though there are no sharks) provide a safe and beautiful swimming spot for even very small children. The social and artistic hub of the North Shore is the town of Hale'iwa, where historic plantation buildings house a mixture of surf shops, cafés and art galleries. This is also the perfect place to grab a bite of 'ono (delicious) food after a day at the beach. If you're in the mood for something sweet, Matsumoto's in Hale'iwa serves one of the best shave ices on the island. If you're not interested in the beach, there's still plenty to do on the North Shore. The arboretum at Waimea Falls has 2,500 plant species from around the world in over thirty botanical collections. For a glimpse of ancient Hawaiian culture, visit Pu'u o Mahuka Heiau, a stone temple where chiefesses gave birth, located mauka of Waimea Bay. For hiking, head out to Ka'ena Point, the northwestern-most point of O'ahu (you can get there from either the North Shore by heading west from Hale'iwa toward Mokule'ia or from the leeward side past Makaha). This seemingly barren landscape is home to a number of native plants and seabirds, like Laysan albatross and wedge-tailed shearwaters. Bring water and protection from the sun, as Ka'ena is a forbidding and shadeless place; it was from this point, the ancient Hawaiians believed, that the souls of the dead leapt into the afterlife. You can't get to the Leeward, or western, side of the island directly from the North Shore. Instead, you have to go around the Wai'anae Mountains by heading south and then taking H-1 west to Farrington Highway. Before reaching the highway, though, you'll pass a vast area of new development known as Kapolei, which is currently being developed into O'ahu's "second city." Just past Kapolei is a resort development called Ko 'Olina, the site of a posh JW Marriott and also Disney's Aulani Resort. The Leeward Coast is usually sunny and dry, with miles of beach and several prime surfing spots. Heading north on Farrington Highway, you'll pass through the towns of Nanakuli, Wai'anae, and Makaha. 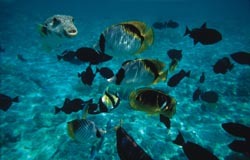 In Wai'anae, Poka'i Bay, protected by a coral reef from heavy surf, provides good swimming conditions all year long. Ku'iloloa Heiau at the end of a peninsula offers great views of the coast. The heiau is 150 feet long and 35 feet wide, with three platforms surrounded by the ocean. The Kane'aki Heiau in Makaha, an agricultural temple, was built between 1450 and 1640; it has been restored by the Bishop Estate and the National Park Service. The beach at Makua, which is past the last town of Makaha, is a wild and undeveloped stretch of sand where you can camp out under the stars and then go for an early morning swim with the pod of dolphins that frequents the coast. Continuing past Makua, you can access Ka'ena Point from the end of the highway. Whatever your age, whether or not you have children, whether you are an ocean or hiking enthusiast, whether you like spending time in museums or surfing, you can find something to make your visit to O'ahu rewarding. You can try new sports, eat foods you've never heard of, hike in rainforests, play on beaches, take in WWII history and not least you can experience what life in a truly multi­ethnic society looks like. Enjoy some of the world's best beaches at Waikiki, Lanikai, Kailua, Waimanalo and Waimea. Learn about Hawai'i's monarchy at 'Iolani Palace.